A responsible and innovative way to significantly reduce bacteria, scale and Legionella risk in cooling towers. EasyWater’s CTF System (Cooling Tower Filtration System) is a simple but innovative approach to significantly reduce bacteria and scaling in cooling towers as well as the risk of Legionella. 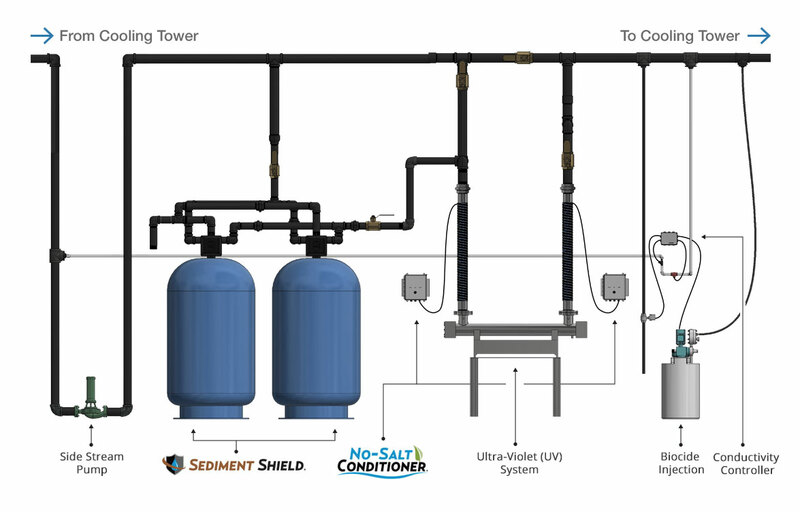 Our CTF System utilizes EasyWater’s backwashing SedimentShield filtration, No-Salt Conditioner and BacteriaShield ultra-violet (UV) technology, all on a continual side stream. CTF System is a great fit for all cooling tower applications and can be a key component in water management plans to control bacteria and the risk of Legionella. CTF System is also a great compliment to SmartGuard RO, which is used to treat the makeup water to cooling towers in hard water applications.